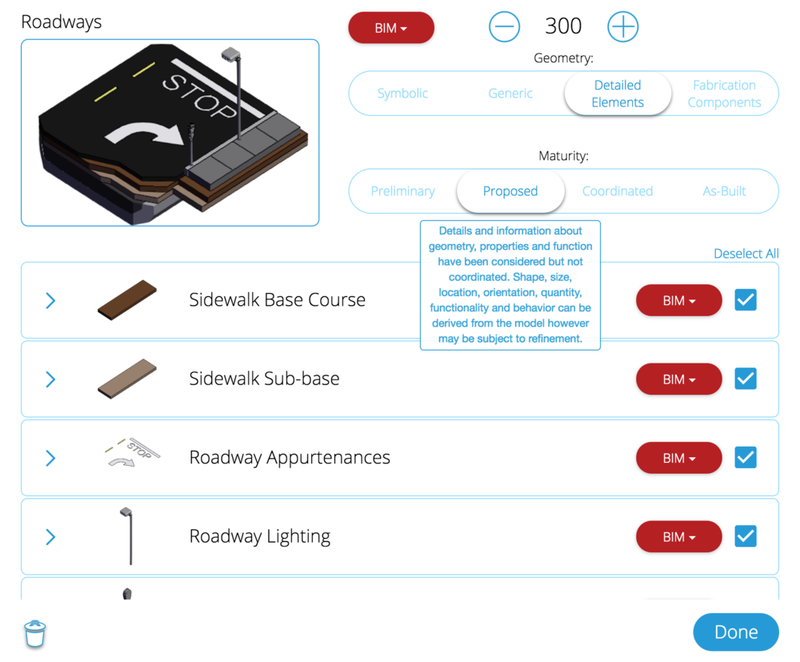 Is a lack of LOD definition hurting your Civil Infrastructure Model? As the use of Building Information Modeling increases every year it is easy to ask “when will some of the same standards that are afforded to buildings be incorporated into the infrastructure side of construction”. Over the past several years efforts have been put into place to develop standards to define the Level of Development requirement via the model. Much of these efforts had a prior focus on building elements such as windows, doors, structural elements and MEP systems leaving a gap when it comes to the infrastructure work on a project or infrastructure projects as a whole. Sometimes the a blanket LOD is applied to a project that is clearly higher than what the team wants or needs for successfully coordinated civil sitework. When the BIMForum published its latest iteration of LOD guidelines in 2017, it provided a comprehensive guide to help define what each model element and dataset should look like that was to appear in the model. However, some essential elements were left out. With the exceptions of bridges, most infrastructure work fails to appear in the guide at all. Even if you dig into the site utility section, the definition explanation at its highest level of detail of LOD 200 providing approximate sizes, vertical control, and apparatus. As the definition is extremely vague, this does not offer enough guidance for clear BIM Execution Plan language leading to misunderstandings and scope gaps during implementation. The lack of an industry-wide standard and a tool for which we can utilize to plan our modeling efforts are dramatically affecting projects. While the lack of development of an infrastructure model might not seem like much of an issue at first, it can wreak havoc on a project, especially on projects where the infrastructure plays a huge role or is the primary focus. Not having consensus on what is necessary to provide to the project can have detrimental effects, leading to project coordination oversites, schedule delays,, and cost overruns. So how can we change this pattern? We believe that there is a way to move towards a more clearly defined and understood definition of the requirements. In the right hands, tools such as LOD Planner are helping projects determine these requirements earlier in the project. By providing easy to understand visuals, LOD Planner allows team members to plan and visually scope model requirements. The best part is they do this for not only buildings but infrastructure work as well. By going through the planning process in LOD Planner team members can have an understanding of the requirements necessary for the project as well as the timeline to deliver them. It is without a doubt that this tool significantly helps improve modeling and BIM coordination deliverables on any deployed project. LOD Planner is a massive stride in the right direction when it comes to infrastructure modeling. Stay tuned to see how FlywheelAEC is working with LOD Planner in the future! There are a lot of BIM consultants available on the market today, but very few of them have experience or knowledge of civil and sitework. Consultants that focus on this type of work have a background in civil planning, design, and construction and will add immense value to your team. They will not just create a 3D model of your project but will consider key constructability and design factors while doing so. Since sitework can be one of the most critical elements of the project, proper planning, coordinating and reviewing designs is vital. The best consultants come from an engineering background and will also understand how the work is put in place, allowing you to push information to the field and eliminating duplicate work. A truly valuable consultant will bring lots of experience and knowledge about sitework to the table. There is a reason that plumbers do not typically install site drainage. It is a different ball game. So if you are hiring a consultant to help you design, model and plan coordination of civil and sitework elements, you want to hire one that is familiar with that type of work. Sitework requires completely different types of pipe, fittings, valves, and components that are not typical to MEP. Having the right tools to model this correctly will deliver a much better end-product. Many MEP consultants will try and convince you that it is just pipe, but the rules for sitework are much different, and since you are working underground you have additional considerations to keep in mind. Also, a real sitework consultant will understand the installation and the most efficient way to deliver the information to the field. Understanding who and how the end-user will utilize your sitework model is very important. There is a lot of automation in the sitework trades including laser graders, machine controlled dozers, robotic total stations, and drones. These tools help keep sitework contractors efficient on large projects. Understanding the deliverables for the sitework contractor to use with these tools is critical. Also, sitework contractors work in tenths of a foot, not in fractions of an inch, which can make a big difference when creating final deliverables. It is critical to making sure that all the work that goes into these models is trusted and put to good use. Understanding how the associated trades work is key to making useful deliverables. Picking the right tool for any job is important. When selecting a sitework BIM consultant, the same rules apply. Finding the most qualified team that can add the most value to the project will pay off in the long run.